"I love you, Bramwell" was a shout that came from the balcony section right before the Maestro was about to start conducting the VSO with Sibelius' The Bard. I noticed his shoulders and his back cringe and his head lowered, and after the laughter from the audience, there was a short silence as he composed himself and got the show started. After intermission, he quipped a bit about this incident thanking his "supporter" for the success of VSO's 2014-15 season. He took the opportunity to thank long-serving clarinetist Cris Inguanti and violinist Joan Blackman who are leaving VSO after this concert. Sibelius' The Bard was a serene and contemplative piece wistfully conducted and delivered by the orchestra. After intermission, Mahler’s Symphony No. 5, a work that's more than an hour long, is a complete departure from his previous symphonies, but is no less significant in scope, scale and inspiration. The piece is eclectic: witin the three parts and four movements, Mahler combines different emotions. He starts off with heroism, then falls into a stupor, sometimes sardonic, then with percussion and horns he moves into the tragedy and nobility, then pauses to go into another mood--satire, then simplicity, afterwards, despair. These convulsive movements that go from high to low and vice-versa is what Jean Sibelius in 1907 referred to as a symphony that contains everything because "a symphony should be like the world". The VSO must have spent a lot of time in rehearsal because this is indeed a difficult symphony to deliver. The Maestro and the orchestra got a rousing applause and a prolonged standing ovation after this piece was completed. . 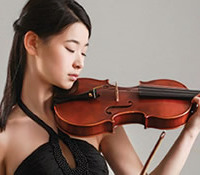 The highlight of the evening was 18 year-old violinist Lucy Wang who performed Ravel's Tzigane, rapsodie de concert . She was the winner of the VSO School of Music's inaugural Concerto Competition, and part of the prize was performing in VSO's season finale. She did get a lot of cheers and a few stood up in ovation.